Two suspects in the murder of two Tennesseans Monday were apprehended in Adair County Tuesday evening. Law enforcement received a call at 5:05 p.m. Tuesday that shots had been fired from the window of a vehicle traveling toward Columbia on Ky. 55 south. Deputy Sheriff Brandon Hitch met a vehicle matching the description, a 90s model S-10, on Ky 55 and attempted to initiate a traffic stop after turning onto Ky. 704. The vehicle continued for a short distance and pulled up to a barn at a private residence. Two male occupants then fled on foot. Kentucky State Police and Columbia City Police were already headed to the scene to assist the sheriff’s department and the two men were quickly apprehended. The men arrested were Alexander Hamilton, 22, of Kingsport, Tenn., and Joseph “JoJo” Clark, 22, of Bald Knob, Ark. Warrants had been issued for both men from Kingsport, Tenn., where a shooting took place on Monday. 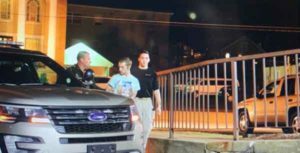 According to the Times News in Kingsport (timesnews.net), the shooting occurred around 5:45 p.m. Monday at Stonecrest Apartments. Trevor L. Reed, 30, died shortly after being transported to the hospital. A female, Shyane I. Bishop, 27, died Tuesday morning. According to news reports, the suspects knew the victims. At the time, Hamilton and Clark were charged with second degree murder and attempted second degree murder. A female was also with the two suspects when they were arrested in Adair County. Samantha Glenn, 25, of Kingsport, Tenn., was also arrested. The three face charges locally of fleeing and evading police, 1st degree and 2nd degree; wanton endangerment; possession of a stolen firearm; possession of a stolen license plate; and public intoxication. Hamilton was charged with operating a motor vehicle under the influence. The Adair County Sheriff’s office obtained fugitive from justice warrants and notified Tennessee authorities of the capture. They will be held at the Adair County Regional Jail awaiting extradition to Tennessee to face murder charges. A murder suspect from Tennessee is taken to the Adair County Regional Jail.